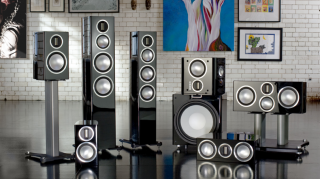 Monitor Audio launches new Gold speaker range for 2015 | What Hi-Fi? The new, eight-strong Gold range replaces the Gold GX range and includes two floorstanders, two bookshelf speakers, two centre channels, a surround speaker and a subwoofer. Monitor Audio claims the new Gold speaker range has a "trinity of enhancements", with key upgrades to the bass cone, tweeter and grille design promising to bring "greater transparency, consistency and visual sophistication". Prices start at £950 for the most affordable compact bookshelf speaker, the Gold 50, and the range is due in shops from the beginning of February. Those three upgrades begin with the Gold series ribbon tweeter, which while mechanically identical to its predecessor on the GX speakers, such as the Gold GX50, Monitor Audio claims improved production tolerances will equal a more open, detailed sound. The bass drivers on the Gold series use a version of the company's dimpled Rigid Surface Technology (RST) cone, as first seen on the GR and GS speakers, as part of "a more efficient drive assembly" that should deliver cleaner, deeper, more accurate bass. Lastly, there are now magnetically-fixed "floating" grilles, updating the look of the Gold range.